Kila Erda is a fifteen year old Norwegian Fjord mare. 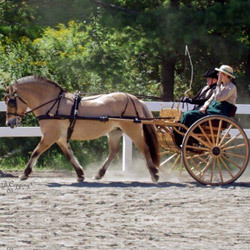 She is a pleasure driving horse, trail horse, and lower level dressage horse. I started using SmartPaks when I went off to college about 10 months ago and left her at home. They have made life so much easier for us. All we have to do is open one up and dump it in her grain. Plus, when we are out of town, I don’t have to worry that anything will get messed up or that she isn’t getting her supplements. I truly do not know what I would do without them and how I ever did it in the past. Erda’s SmartPak contains Accel, Quiessence and MSM 99.8% during the summer when she is in work.